Sometimes small fragments are the only tangible remains from buildings of the past. These artifacts represent different phases in the Rotunda’s history. 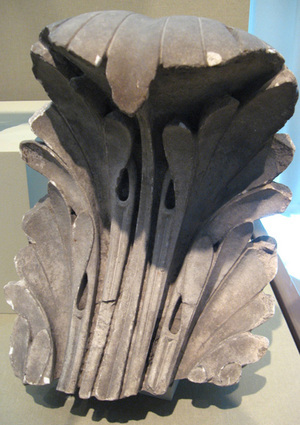 The stone acanthus leaf from the portico of the original Jefferson Rotunda broke off during the great fire of 1895 and has been preserved in Special Collections. 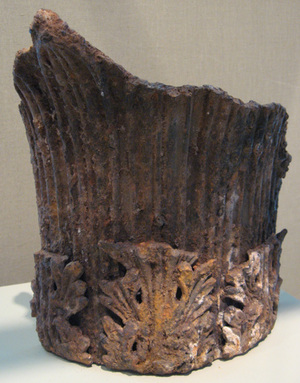 The fragment of a cast-iron interior column capital from Robert Mills’s Annex was discarded after the fire and remained buried in a rubble heap, discovered during the recent expansion of Rouss Hall. 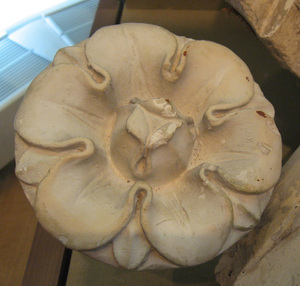 The plaster capital fragment and rosette from Stanford White’s interpretation of the library indicates that White’s interiors were vastly more ornamental than Mills’s. 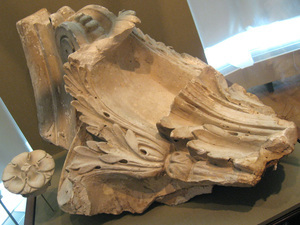 These pieces, and the rest of the Stanford White reading room, were removed in the 1970s restoration of the Rotunda.